Previously, we learned our jQuery AJAX CRUD tutorial. Today we will learn how to create or insert, read, update, and delete database records with React. 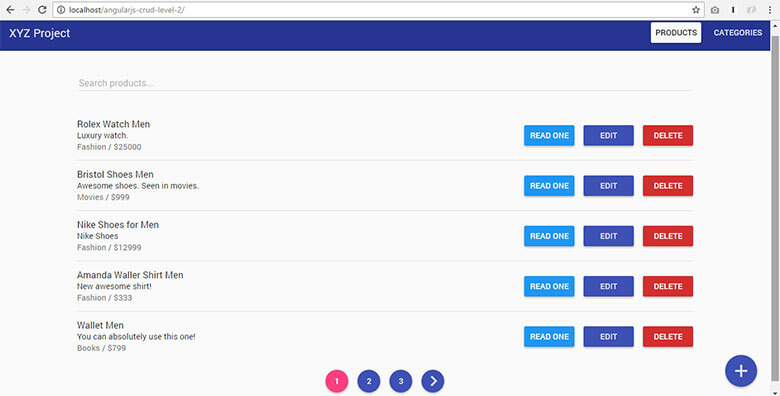 6.0 How To Read JSON Data Using React? 7.0 How To Create or Insert Data Using React? 8.0 How To Read One Data Using React? 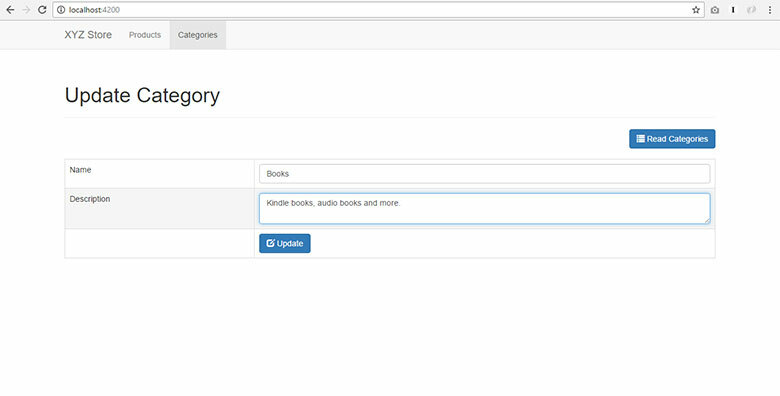 9.0 How To Update Data Using React? 10.0 How To Delete Data Using React? Below are some screenshots of our tutorial's output. You can click an image to view the larger version of it. Use the left and right arrow to navigate through the screenshots. Using React allows you to simply express how your app should look at any given point in time. React will automatically manage all UI updates when your underlying data changes. When the data changes, React conceptually hits the "refresh" button, and knows to only update the changed parts. Aside from Facebook and Instagram, many well-known companies uses React including: Dropbox, PayPal, Nextflix, Khan Academy, Airbnb, Alipay, Asana and many more. It is very important that we understand the thought process of building web apps with React. Here's a start: We start with a mock. 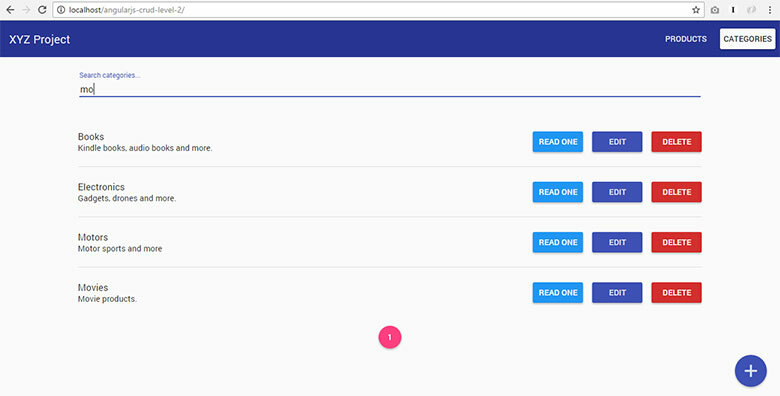 Then, we break the UI into a component or parts of the UI. In the following image, you can see the mock and components in colored boxes. I will not discuss this topic longer here. To learn more about how to think in React, click here. React concepts can be hard to grasp at first, but you will get there. If you do actual coding with React, you will understand it better and faster. This is why our step-by-step React CRUD tutorial below will be very useful. 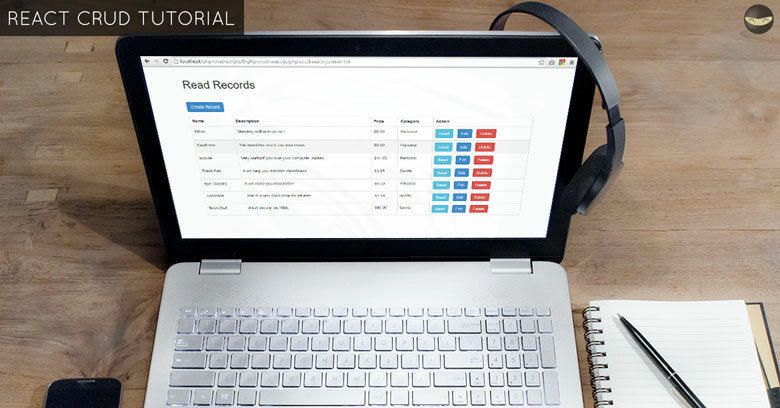 Here we will learn how to create, read update and delete database records - CRUD operations with PHP, MySQL, React, Babel, jQuery and Bootstrap. Most audience of our blog are very familiar with these technologies. The goal of this tutorial is for you to learn how to use React. React is only the V in MVC. React don't make assumptions about the rest of your technology stack. 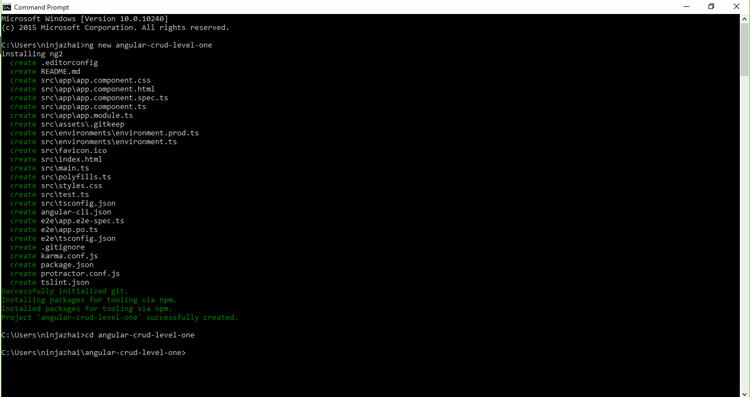 PHP - will handle server side script. MySQL - will store our data. 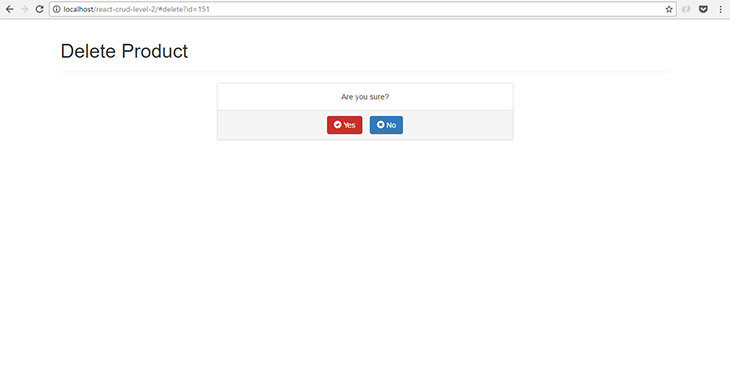 React - will make our UI fast and interactive. 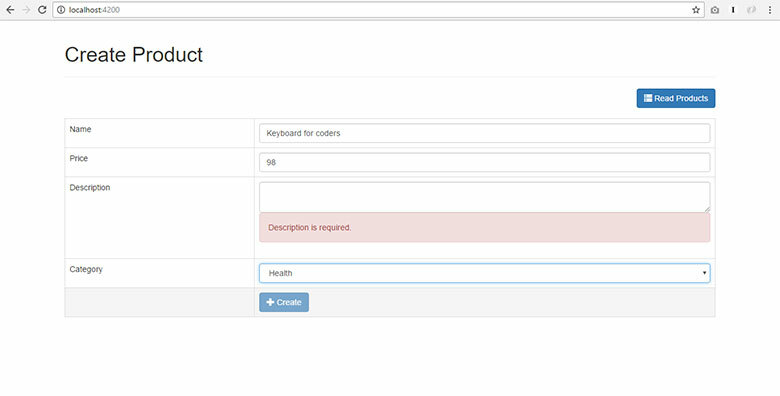 jQuery - will do AJAX requests. React official docs shows jQuery examples. 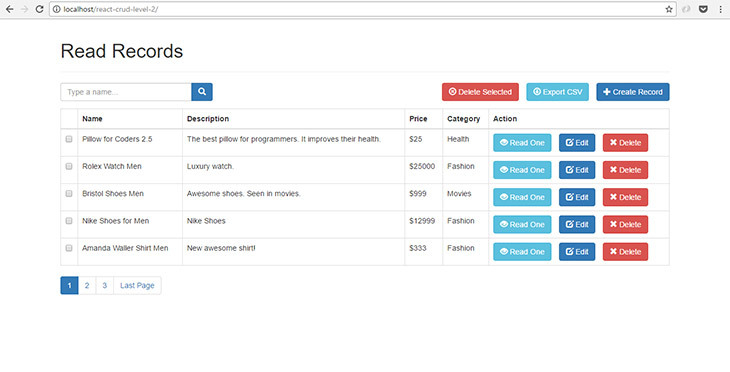 Bootstrap - will make our UI look better. 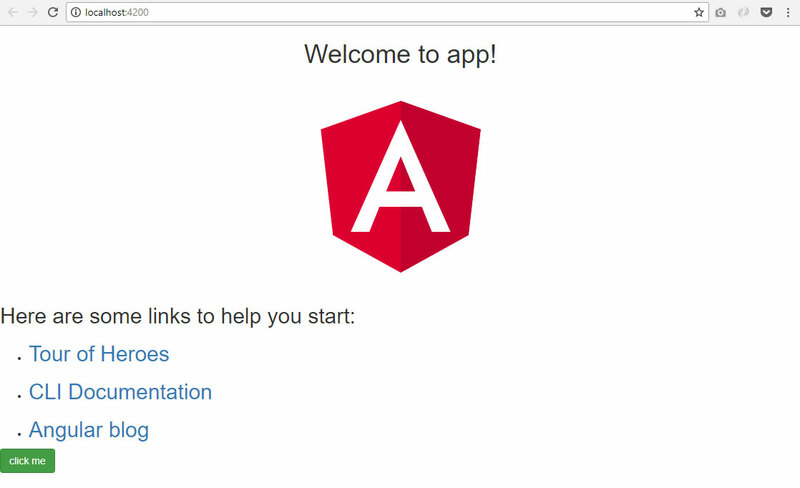 For those who ask, React can work with AngularJS. 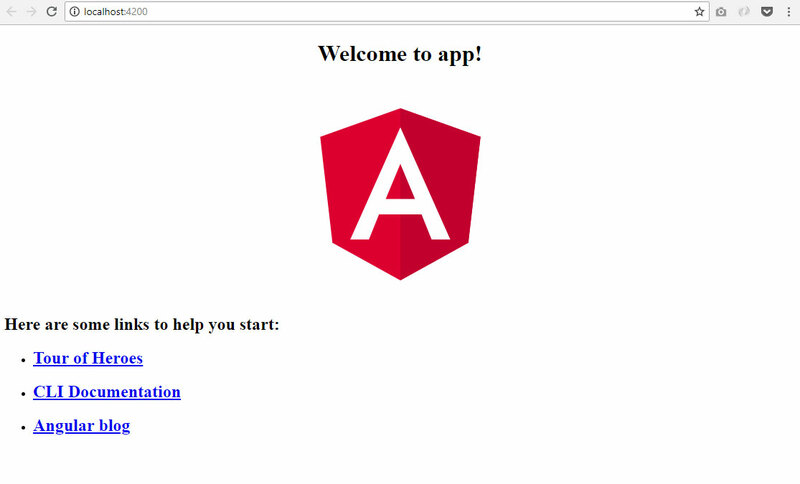 In short, it can work with the MEAN (mongoDB, Express, AngularJS and NodeJS) framework. We will have another tutorial for that soon! Please subscribe so I can notify you when it is done. We did not include REST API source code in this page because we want you to focus on learning how to code with React, not PHP. The data above will be consumed by our React app. The list of products will be displayed in Bootstrap table with buttons like "Read One", "Update" and "Delete". You will see it in the "How To Read JSON Data Using React?" section of this tutorial. 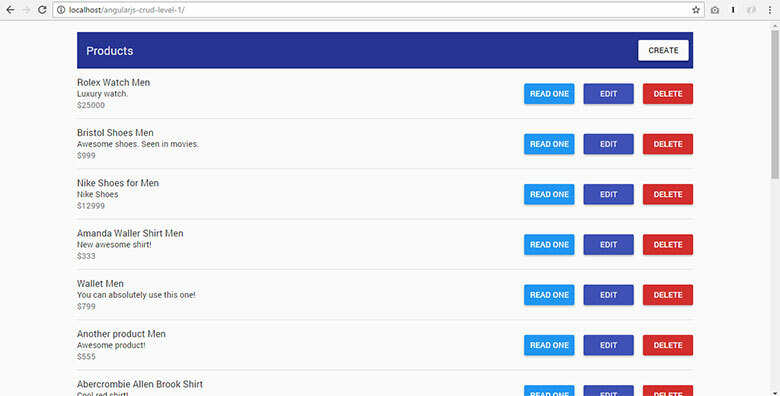 Our LEVEL 1 source code will have the following files and folders. The functions of each files above were explained in different sections of this tutorial. 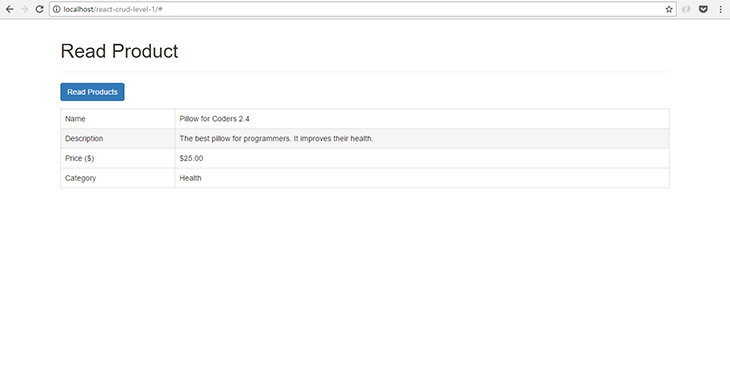 Bootstrap CSS - to make our web app look better. 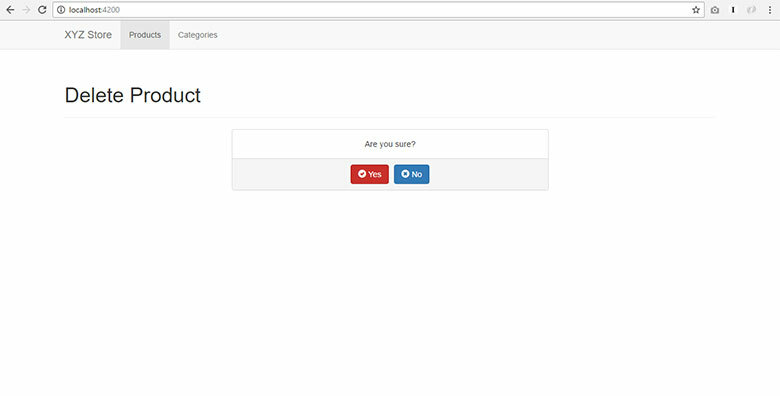 Custom CSS - Bootstrap CSS cannot do it all so we need this custom styles. Container DIV tag - our React application will be injected in this DIV tag. Create index.html and put the following code. Please make sure you are using the React version we are using above. This tutorial might not work with the latest version of React. 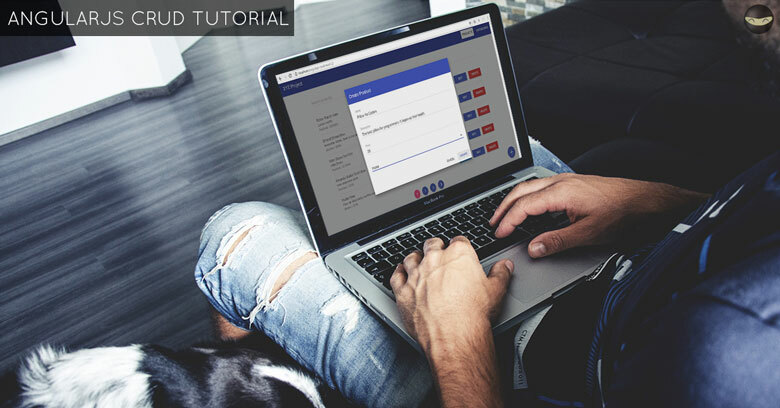 The purpose of this tutorial is to help you learn the basic concepts of React and how to use it in a simple application. This tutorial is good for you in that case. This tutorial is NOT for you if you need to work with the latest version of React and use it in a production environment. 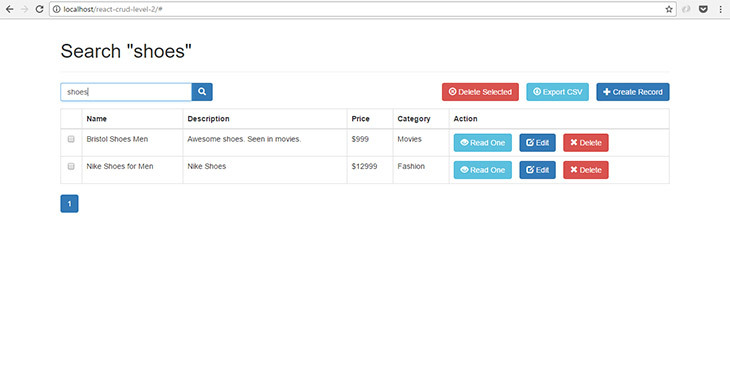 As said earlier, Bootstrap CSS cannot do it all so we need this custom styles. Create "assets" folder inside "app" folder. Create "css" folder inside "assets" folder. Create "custom.css" file inside "css" folder. Open "custom.css" file and put the following code. Our "main component" will hold all other components of our react application. Open "app" folder. Create "main.component.js" file. Put the following code. Open "app" folder. Create "product" folder inside "app" folder. We will see the codes on the next several sections of this tutorial. 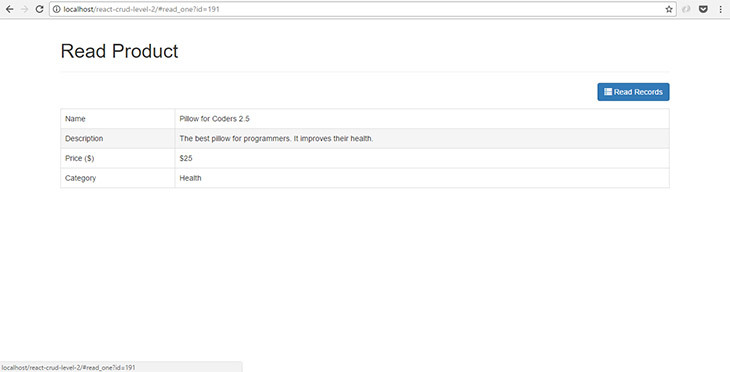 See it for yourself by running http://localhost/react-crud-level-1/index.html on your browser. 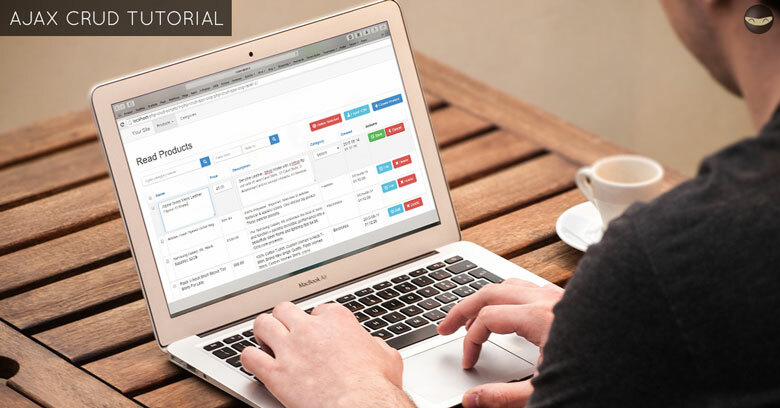 This component will hold the product records using an HTML table. It will hold the "create product" button as well. The button or "top actions" are located on the upper right corner of this component. Open "products" folder inside "app" folder. Put the following code in it and save it. The previous section makes use of "TopActionsComponent". This component holds our "create product" button. 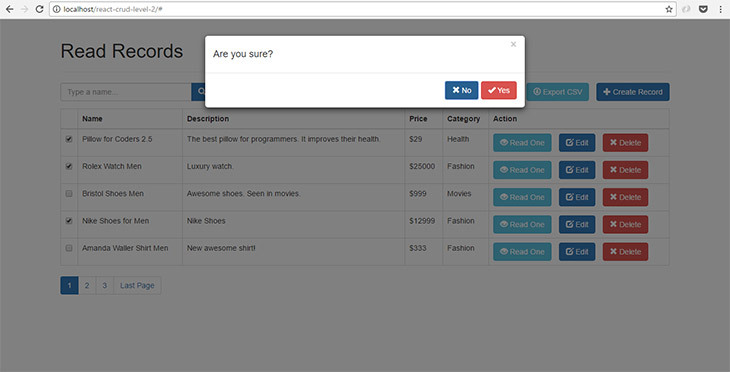 You can add more buttons in this component. For now, we have only one. Still in the "product" folder. 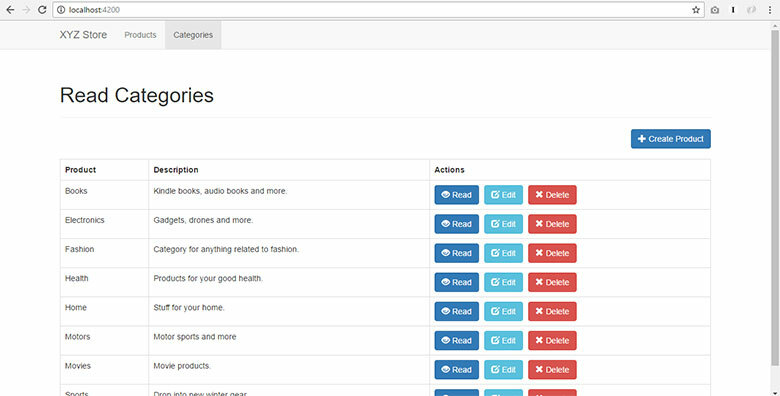 Open "top_actions.component.js" file. We previously made use of "ProductsTable" component as well. This will hold the table header and table rows with products data. Still in the "product" folder. 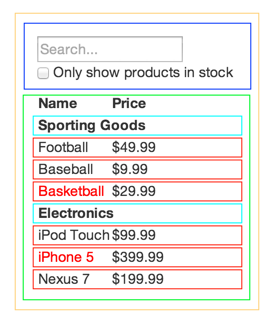 Open "product_table.component.js" file. 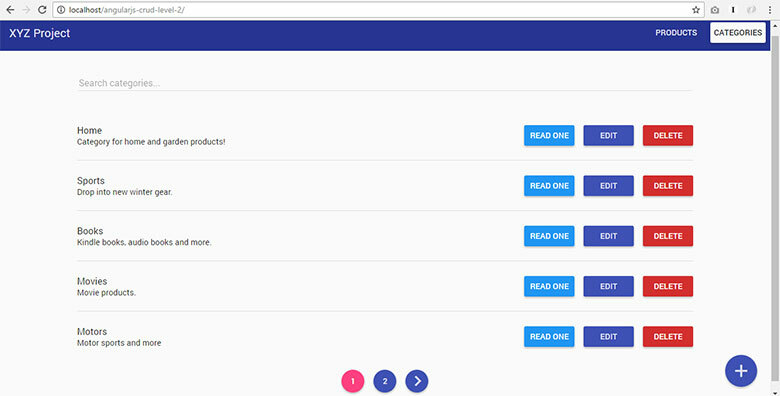 On the previous section, we used the "ProductRow" component. This component will hold a table row with product data. It will hold three buttons as well. The "Read One", "Edit" and "Delete" product button. Still in the "product" folder. 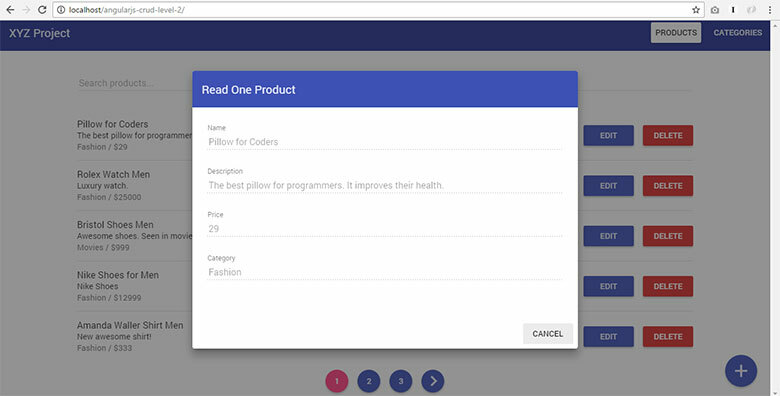 Open "product_table_row.component.js" file. 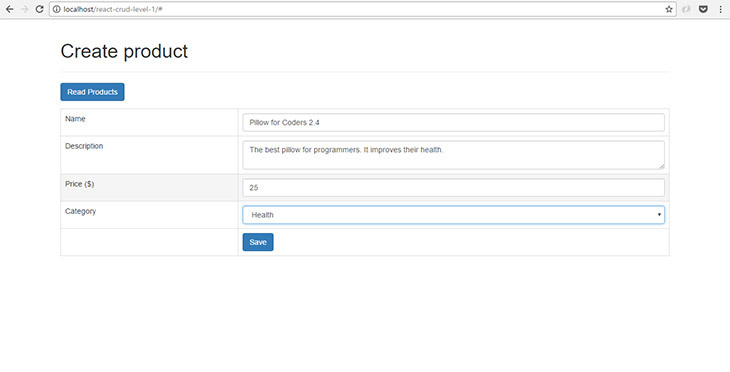 If we completed the steps above, the output should be an HTML table with product data on each table row. The "Read One", "Edit" and "Delete" buttons should be seen on each table row as well. 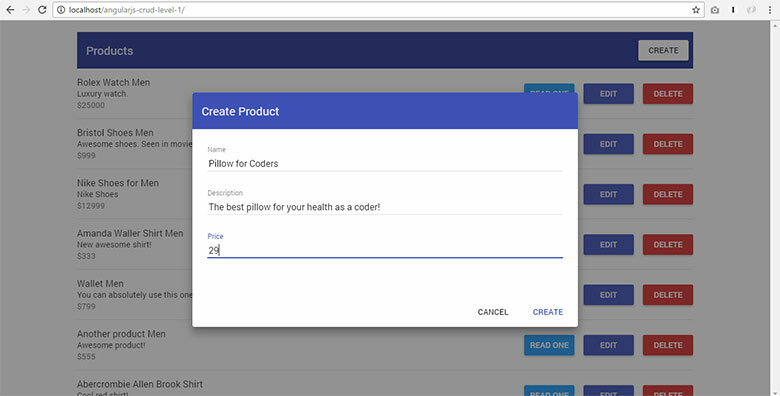 The "CreateProductComponent" class will contain the logic and HTML of our app's "Create Product" feature. Place the following code inside create_product.component.js file and save it. We need to initialize states for this component. Usually, initial states are empty as seen in the getInitialState method. 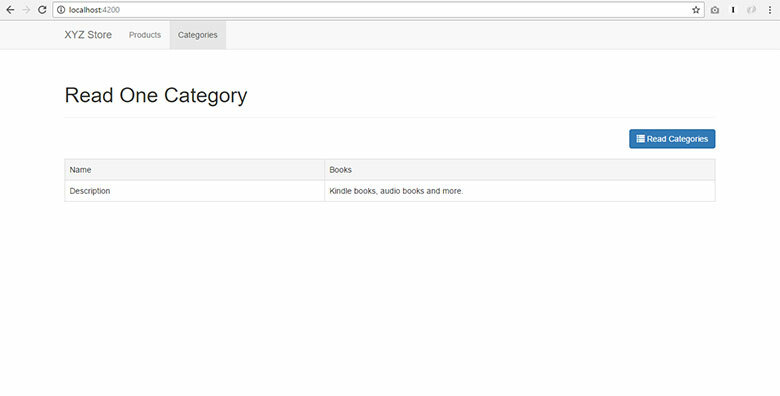 When component was mounted, we will get the list of categories from the API. The returned categories will be used in the form's "categories" dropdown field. When component was unmounted, we need to stop the server request, just in case the request is still pending. 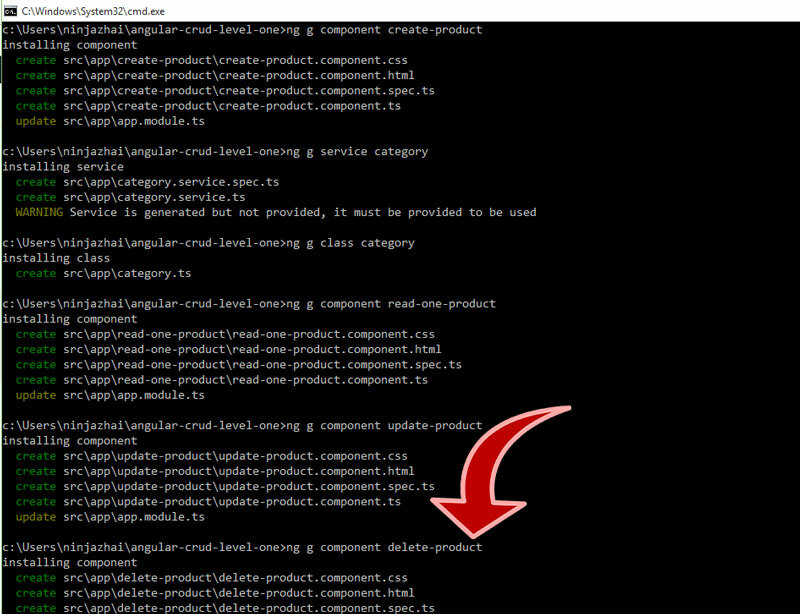 Replace "// initial component states will be here" of the previous section with the following code. We need methods to keep track of change on our form fields. As user types or changes a field's value, it is saved to the component's state. Replace "// handle form field changes here" of the previous section with the following code. When user clicks the "save" button, form data must be sent to the API. This way, data will be saved on the database. We need the "onSave" method to handle this event. Replace "// handle save button here" of the previous section with the following code. Now you're asking: Where's the HTML form? Our HTML form is in the "render" method. Replace "// render component here" of the previous section with the following code. // make categories as option for the select tag. this.state.successCreation == "Product was created." ? this.state.successCreation == "Unable to create product." ? Unable to save product. Please try again. 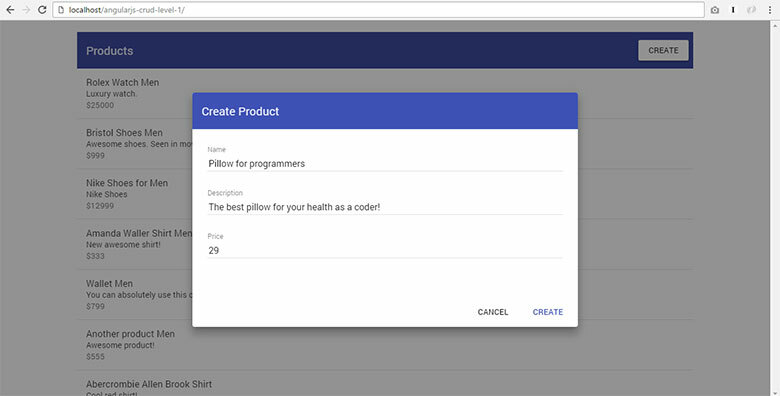 When you click the "Create Product" button, output that you should see is an HTML form with fields: Name, description, price and category drop-down list. A "Save" button should be seen as well. Try to fill-out the form and click the "Save" button. Click the "Read Products" button and see if your record is in the list. If it's there, it means our React app is working. The "ReadOneProductComponent" class will contain the logic and HTML of our app's "Read One Product" feature. 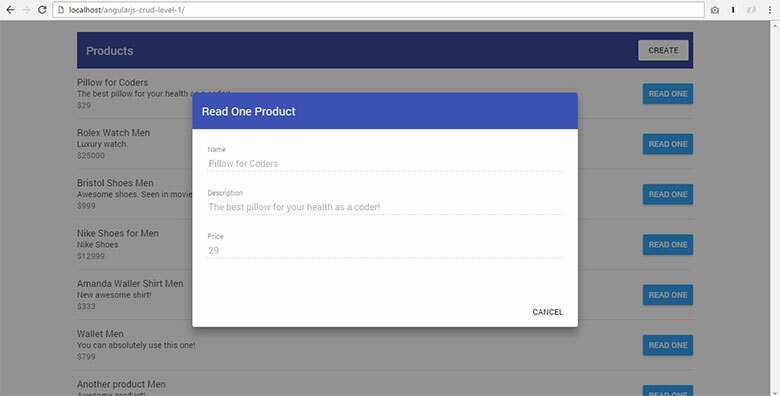 Place the following code inside read_one_product.component.js file and save it. Initial states are empty as seen in the getInitialState method. 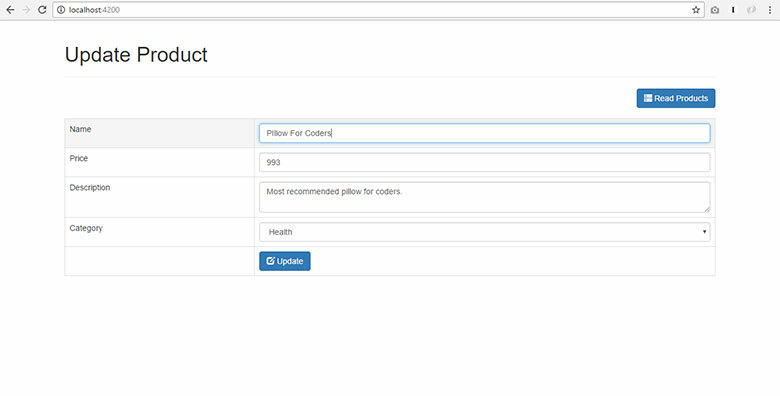 When component was mounted, we will get the product data from the API. The returned data will be set to component state. The state's value will be used in HTML table. Replace "// initial component state will be here" of the previous section with the following code. 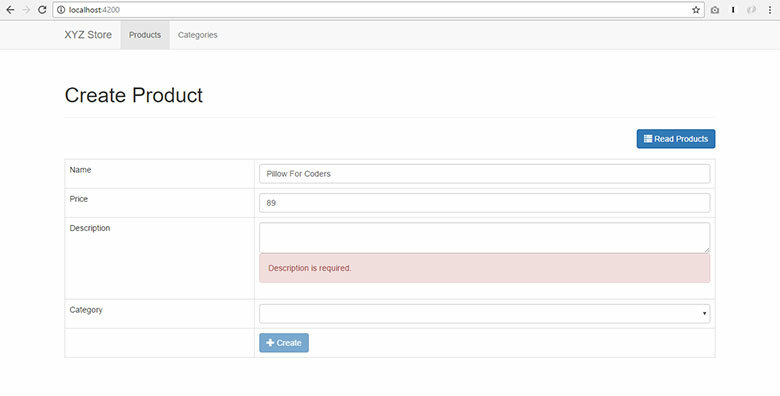 We will use the "render" method again to render this "ReadOneProductComponent" HTML on the web page. 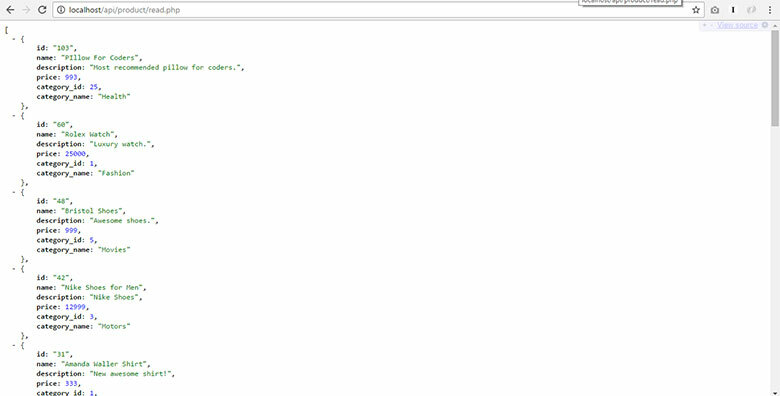 Replace "// render component html will be here" of the previous section with the following code. 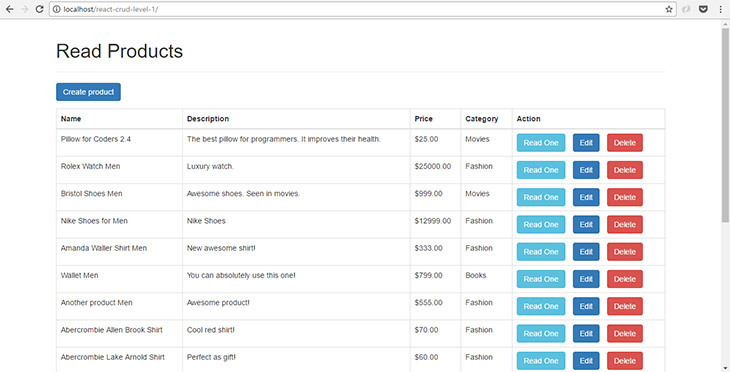 When you click the "Read One" button, you should see an HTML table with a product's data. The "Read Products" button should be seen as well. 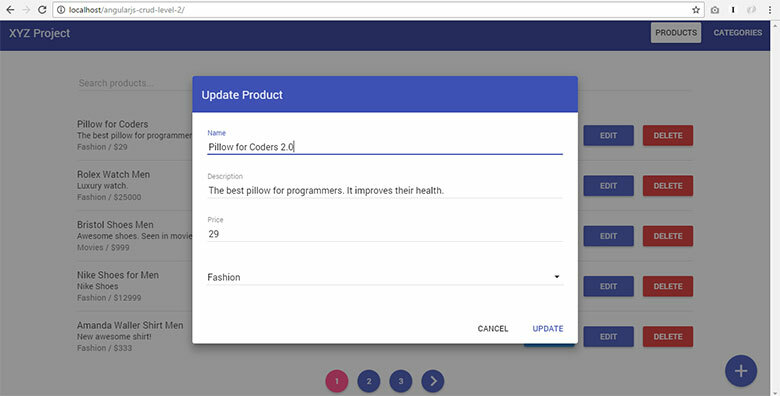 The "UpdateProductComponent" class will contain the logic and HTML of our app's "Update Product" feature. Place the following code inside update_product.component.js file and save it. Initial component states are empty as seen in the getInitialState method. 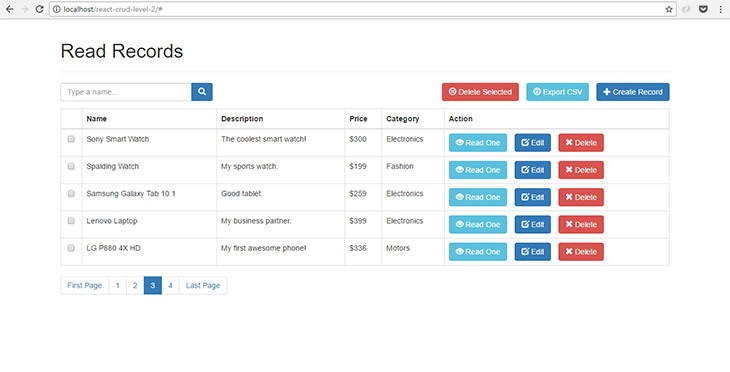 When component was mounted, we will get the list of categories from the API. The returned categories will be used in the form's "categories" dropdown field. 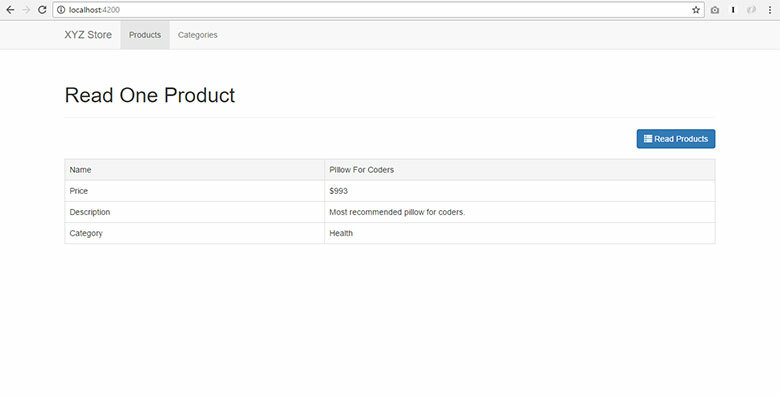 We get a product data based on given product ID as well. This will fill out the "update product" form. 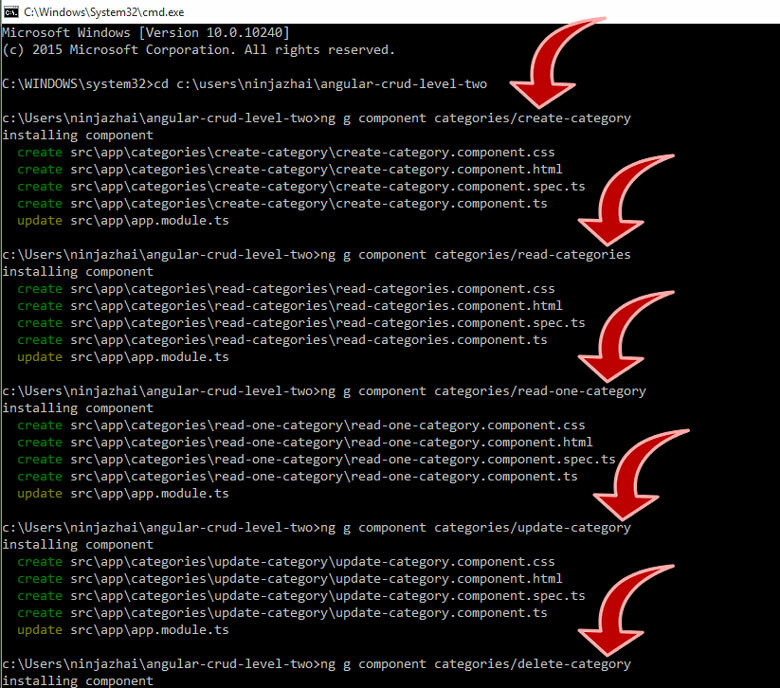 When component was unmounted, we need to stop both server requests, just in case any of the request is still pending. 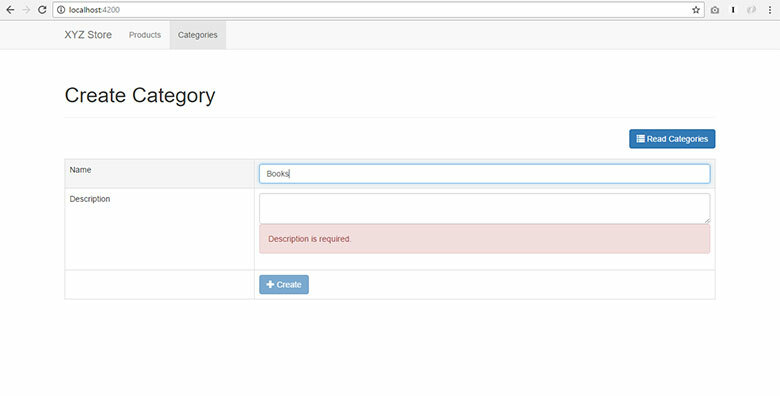 We need methods to keep track of any input changes on our form fields. As user types or changes a field's value, it is saved to the component's state. When user clicks the "Save Changes" button, form data must be sent to the API. The updated data will be saved on the database. We will create the "onSave" method to handle this event. Replace "// handle save changes button here" of the previous section with the following code. 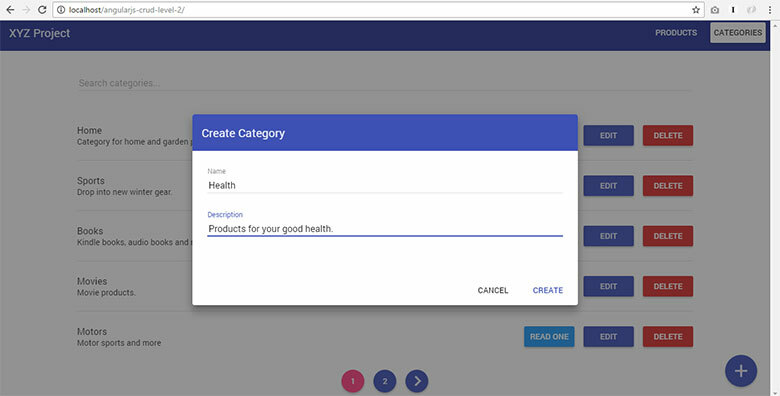 Now you're asking: Where's the HTML form filled-out with product data? 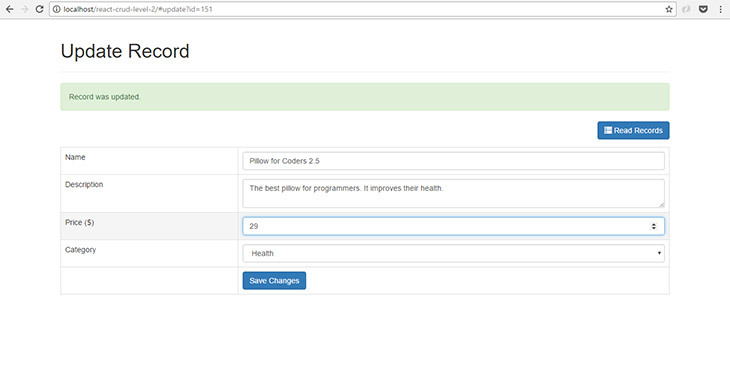 Our HTML form is in the "render" method below. this.state.successUpdate == "Product was updated." ? this.state.successUpdate == "Unable to update product." ? 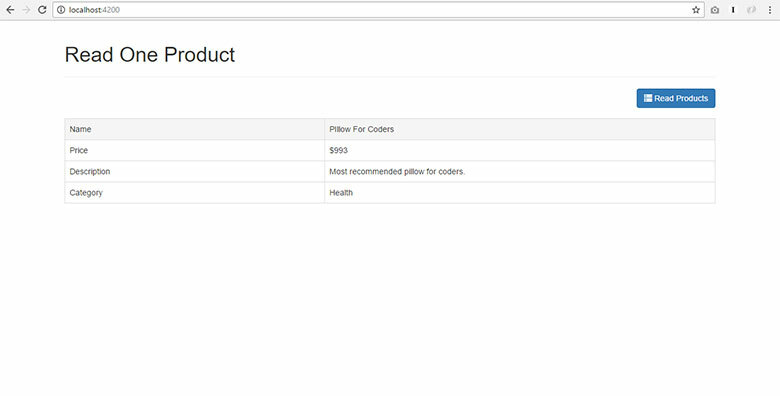 Unable to update product. Please try again. 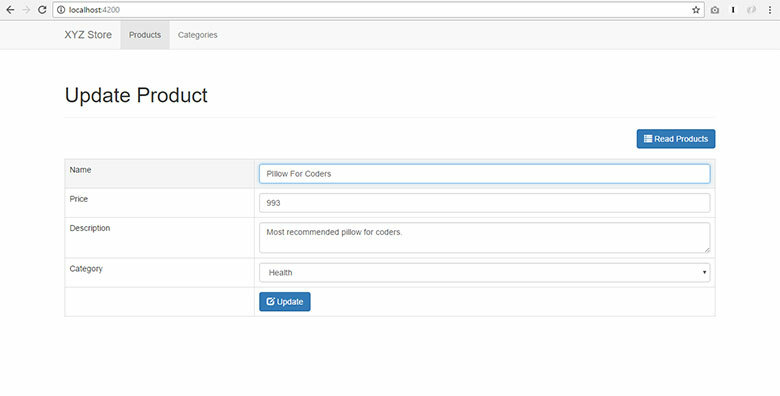 When you click the "Edit" button, output that you should see is an HTML form with fields: Name, description, price and category drop-down list. These field must be filled out with product data to be edited. A "Save" button should be seen as well. Try to edit the form and click the "Save Changes" button. 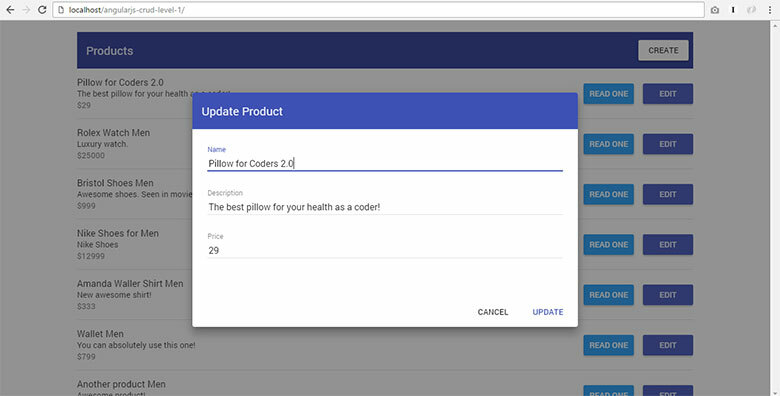 Click the "Read Products" button and see if your record was updated in the list. If it's there, it means our React app is working. The "DeleteProductComponent" class will contain the logic and HTML of our app's "Delete Product" feature. Place the following code inside delete_product.component.js file and save it. When this component was mounted, we'll just have to change the page title. Replace "// componentDidMount will be here" of the previous section with the following code. If user clicked the "Yes" button, record will be deleted. It triggers our "onDelete" method below. 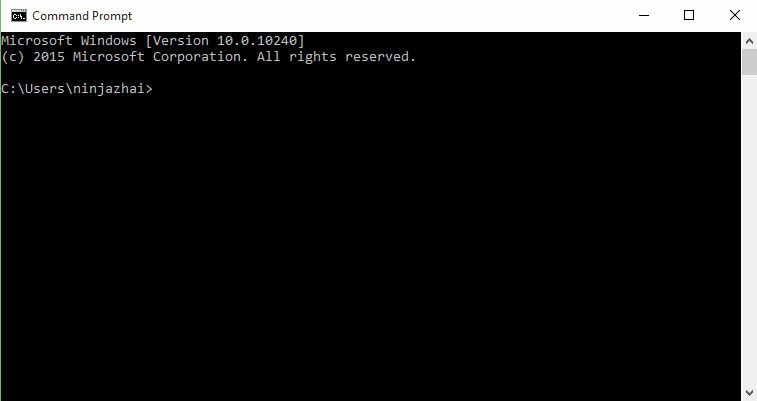 Replace "// onDelete will be here" of the previous section with the following code. Our "render" method contains the message prompt HTML. 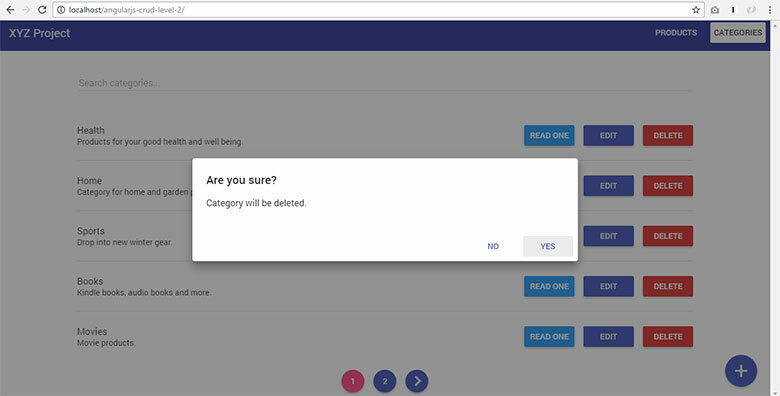 It asks the user if he's sure to delete a record. Replace "// render will be here" of the previous section with the following code. When user click the "Delete" button, a message prompt will be shown. 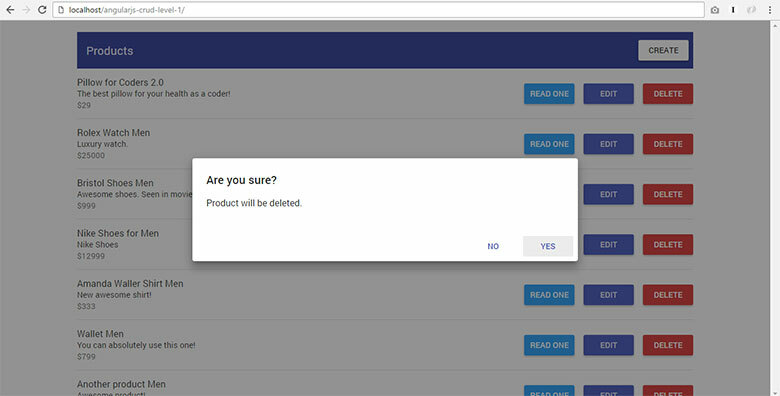 It asks the user to confirm the deletion of a record. Specifically, message will say "Are you sure?". 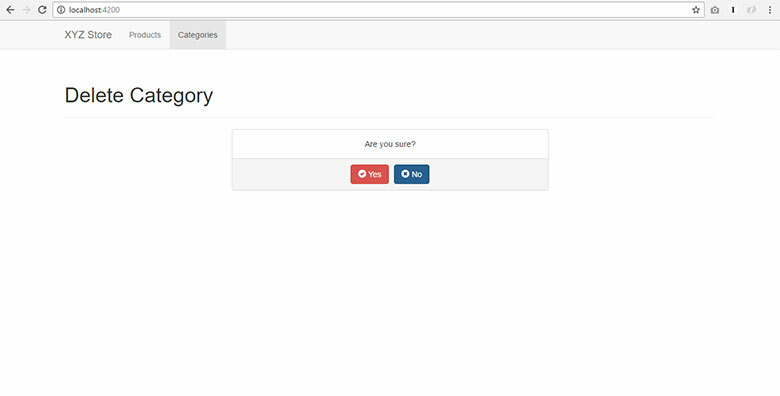 If user clicked "Yes", record will be deleted from the database. User will be redirected to the product list. 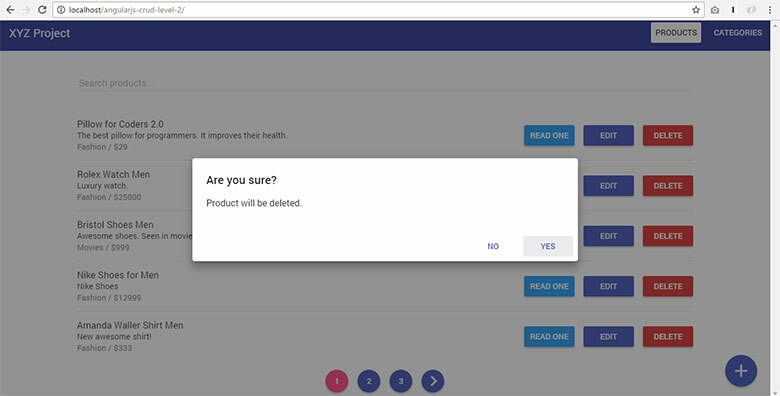 If user clicked "No", user will be redirected to the product list. This means you will download the LEVEL 1 and LEVEL 2 source codes in separate packages. Select "ALL LEVELS" below and then you click the "Download Now" button. Here are useful resources related to React. 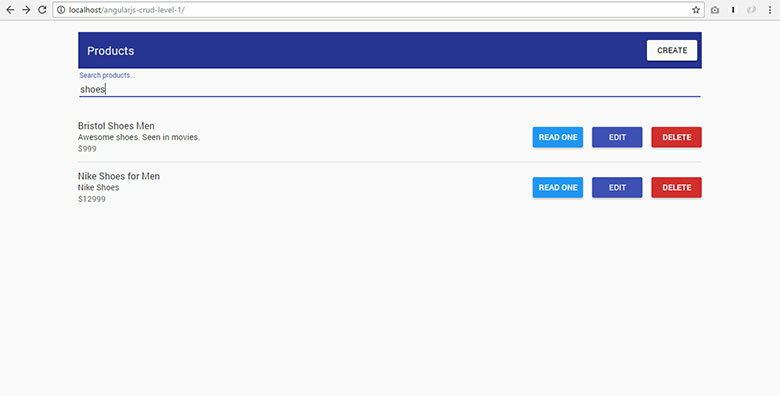 Getting Started with React - the official documentation of React. Data Fetching for React Applications - useful talk about React by Facebook engineers. React Tutorial in 18 minutes - useful for more basic understanding of React concepts. 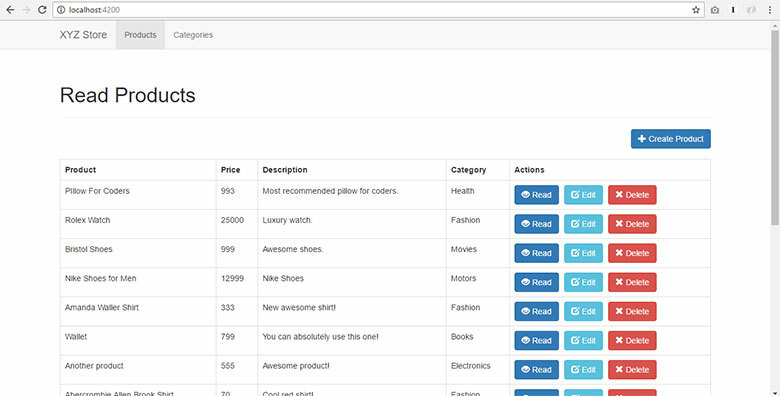 Awesome React - huge list of React resources. Thanks for reading our step by step tutorial about React CRUD Tutorial! 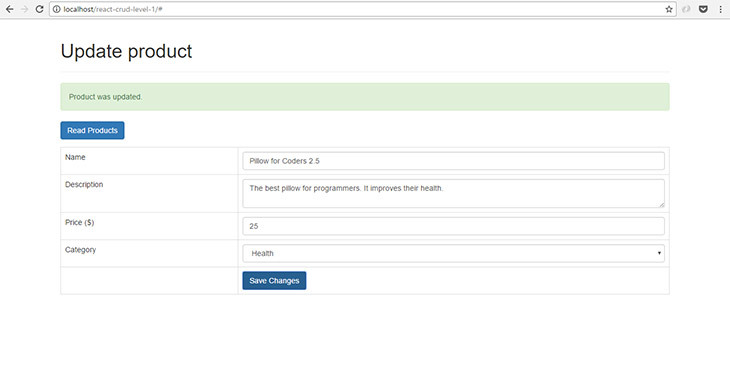 Today we are going to do a code that can move options between two select boxes and save the changes to the database. I think this functionality will improve the user experience since the interface is intuitive. In this example, we are going to have the first select box (left side) which contains the list or data of available objects, the buttons that will make the options move either to the left or right, the second select box (right side) which contains the list of assigned objects, and of course, the save button. assigned_objects table – this will be used to store the ids of assigned objects. which is to be saved in the database. 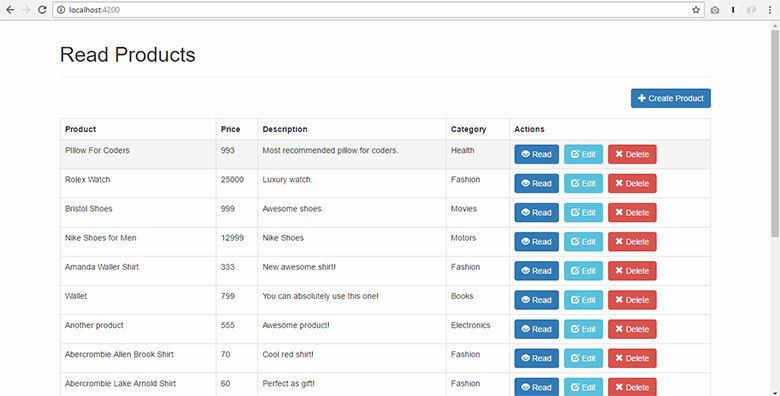 users table – this will be used to store the user objects. If you have many object types stored in your database, you have to use a loop to generate the pair of select boxes and buttons. Thank you for learning from our post about: Move Options Between Two Select Boxes. In my opinion, it looks fast, smooth and clean. The hover animation is really nice. I love it. But there’s a problem. 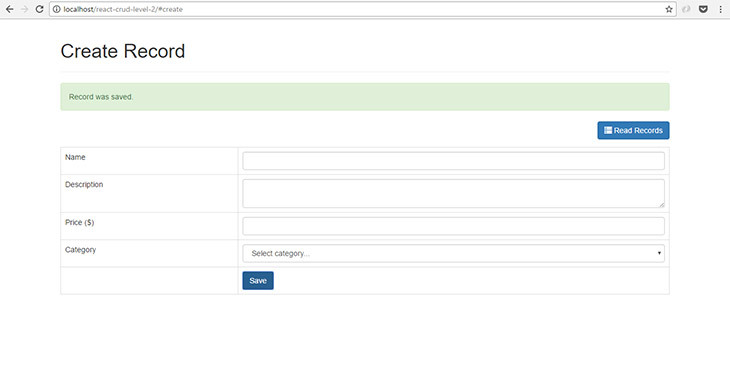 The script provided by Scriptiny is for horizontal dropdown menu only (as you can see in the picture above). But I needed it to be a vertical dropdown menu like some people were asking about. I’m gonna show you the example code I tweaked to make this a vertical dropdown menu. 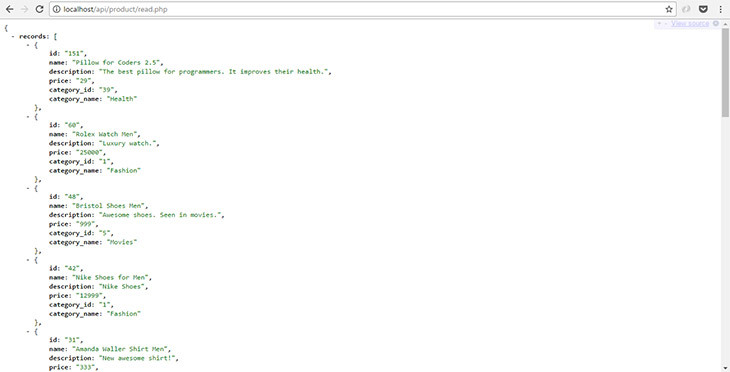 Our index.html code looks like the following. 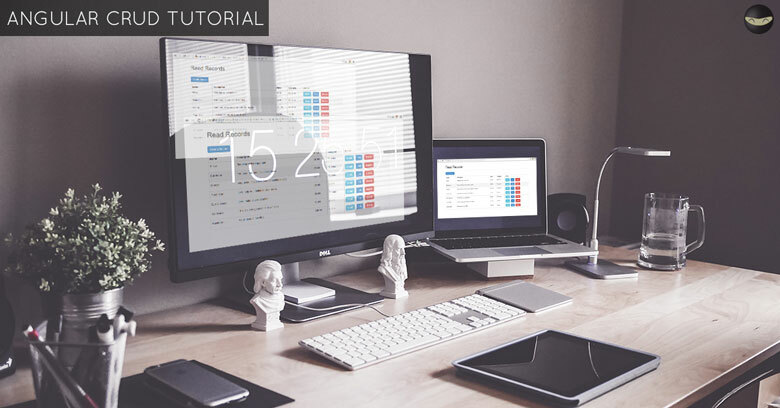 Thank you for learning from our post about: How To Use Vertical TinyDropdown 2. You can see this example on many sites today such as yahoomail. When you click on the search box, the word “Search” will gone. When you click on other part of the webpage, the word “Search” comes back in it. <input type="text" value="Type keywords here..." size="40"
You can download all the code used in this tutorial for only $5 $1!